At Google I/O, we launched the Wear OS by Google developer preview 2. This update added support for Actions on Google (AoG) and more power-related enhancements including a new battery saver mode. 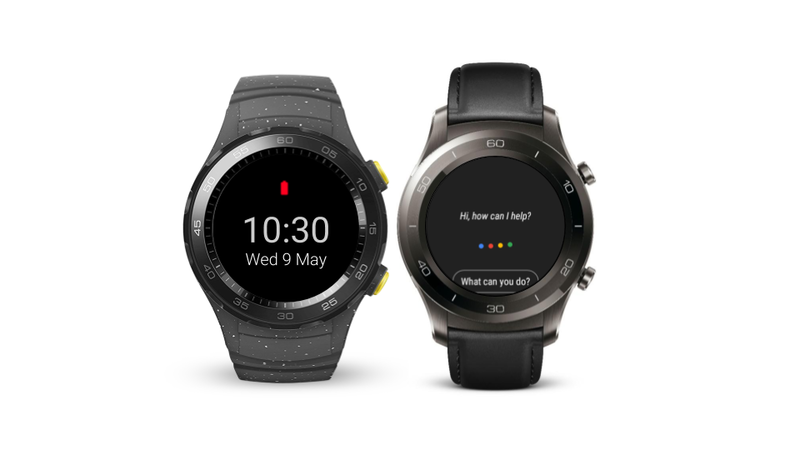 This developer preview includes updated Android Emulator images and a downloadable system image for the Huawei Watch 2 Bluetooth or Huawei Watch 2 Classic Bluetooth. This preview release is intended for developers only and not for daily or consumer use. Therefore, the preview release is only available via manual download and flash. Please refer to the release notes for known issues before downloading and flashing your device. We have revamped the Google Assistant on Wear OS to support features such as visual cards, follow-on suggestion chips, and text-to-speech. For developers, we added support for Actions on Google to Wear OS and existing Actions will work on Wear OS out of the box. Be sure to observe best practices for Actions on Google to get the best results such as short concise dialog and adopting to both visual and vocal feedback. This feature does not depend on Android P and is being rolled out to all Wear 2.0 users. In this Android P developer preview, we are launching an enhanced battery saver mode. While the watch is in this mode, the watch shows a power-efficient watch face and turns off a set of services including radios, the touch screen, and tilt to wake. Users can get the time by pressing the side button. A long press allows the user to switch back to a fully-operational mode and perform tasks such as paying with NFC or replying to a message. Developers should assume that their apps, watch faces, and complication data providers are not available in enhanced battery saver mode. Roll back of Wi-Fi off when BT is disconnected: To improve power consumption, the last developer preview would not connect to Wi-Fi when disconnected from Bluetooth. After listening carefully to user and developer feedback, we decided to roll back this change. Limited background activity and foreground service: A number of health and fitness developers have said their apps require background monitoring of the user's motion and other vitals throughout the day. The developers said their apps cannot perform background monitoring if background services are unable to set alarms and jobs. For these types of exceptional use cases, we recommend that the apps use foreground services to anchor alarms and jobs. For other use-cases, developer should look at both foreground service as well as limiting jobs and alarms to while the watch is on charger. We are still fine tuning this feature, your feedback and use-cases will be most helpful in helping us get this right. Smart Reply has been enabled for bridged notifications from the user's smartphone for some time. With the latest developer preview, we are introducing simplified Chinese support for our users in China. This feature is powered by an on-device model using TensorFlow Lite and the model is optimized for low-memory, low-power devices. // Wear OS requires a hint to display the reply action inline. 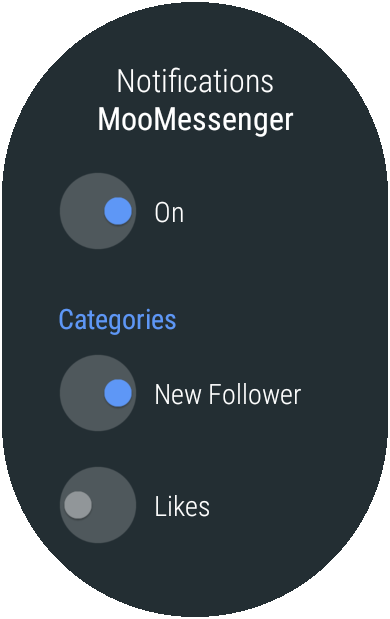 In addition, for messaging apps, we recommend that developers use MessagingStyle notifications. This can give the algorithm a more structured data set on which to base its recommendations. Today, we are launching the beta of the next Android Wear update. As we mentioned at Google I/O, this will mainly be a technical upgrade to API 26 with enhancements to background limits and notification channels. LG Watch Sport users can go to this webpage to sign up and the factory image will automatically be downloaded to the watch you enroll. As this is a beta, please be sure to review the known issues before enrolling. If you don't have a watch to test on, you can use the Android emulator. 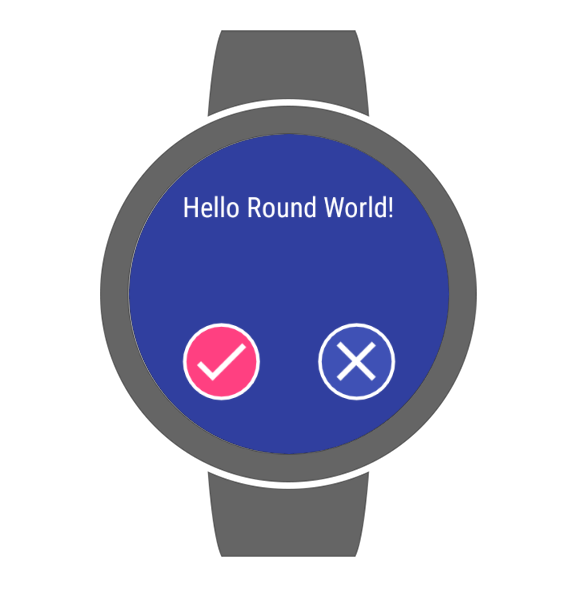 For developers working with Android Wear for China, an updated emulator image is also available. In this update, users can choose the types of notifications they receive via an app through notification channels. This gives users finer-grained control than muting all notifications from the app. For notifications generated locally by Android Wear apps, users will be able to customise the notifications channel they want to see, right on their watch. Please refer to the Wear notification sample for more details. For notifications bridged from the phone, the phone notifications channel settings will dictate what is shown on the watch. There are increased restrictions on background services. Developers should assume services can no longer run in the background without a visible notification. In addition, the background location update frequency will be reduced. Battery-saving best practices such as using JobScheduler should be adopted to ensure your app is battery-efficient and able to perform background tasks when possible. We expect this to be the only beta release before the final production release. Thank you for your feedback so far. 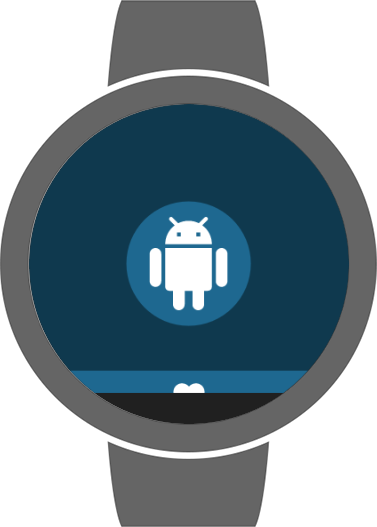 Please submit any bugs you find via the Android Wear issue tracker. The earlier you submit them, the higher the likelihood that we can include the fixes in the final release. Wear 2.0 launched back in February with added support for new hardware features in addition to adopting new Material Design themes, guidelines, and a simpler vertical UI pattern. It also introduces a complications API, making it easier for apps to provide data to watch faces, and watch faces to incorporate external data. The final big update was that, apps targeting Wear 2.0 now have the ability to operate in a standalone mode, without needing a connection to a companion app on the phone. Use the WearableDrawerLayout navigation drawer for simple and infrequent navigation: Simple navigation includes tasks such as accessing app settings, switching users or logging out. You can implement this on Wear 2.0 to switch between different views or sections of the app via a swipe down from the top of the screen, or an action drawer can be set up for context-specific actions when swiping up from the bottom of the screen. Present a navigation drawer as a single-page drawer to enable users to navigate views quickly: A navigation drawer can be presented as either a multi-page or single-page drawer. The single-page layout is useful for when the user is expected to navigate quickly between 7 or less views of the app. Remember that if the app is using a single-page drawer, the iconography should be clear and understandable as there will not be any sort of text labeling in this layout. If there are more than 7 views to navigate to or the views are not easily represented by icons, you should instead use the multi-page drawer layout. Use multiple app launchers if your app has two or three discrete functions: For example, if your app supports both activity tracking—with various options, actions, and views—and historical analysis and management of tracked activities, you can use multiple app launchers to handle these tasks. Alternatively, if your app has a simple home screen, these features could be placed in line, at the bottom of the screen. Use peeking at the top of the action drawer to provide quick access to the primary action: If there is no primary action associated with the view, override the default behavior and force an overflow button to peek instead, exposing all actions at the bottom of a view, when tapped. Ensure that for devices using Wear 2.0, your app takes advantage of these new UI patterns to provide a consistent user experience. Check out more training resources for Wear Navigation and Actions and the Material Design specifications for Navigation and Action Drawers. 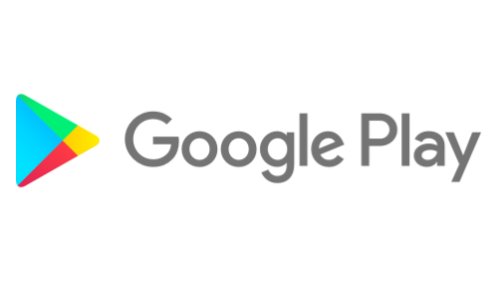 Wear 2.0 uses a simpler vertical navigation pattern, removing the horizontal swiping gesture to present actions for a notification. Notification actions are now presented as a single primary action (if applicable) at the bottom of a notification. If there is no primary action, expanding the notification will present options in a single, vertically scrollable view. Support expandable notifications: Use BigTextStyle so that users can see more content on their watch. Use the collapsed view of the notification (if applicable): Add the primary action for your notification to the collapsed view of the notification using setContentIntent(), where appropriate. For messaging apps, use the MessagingStyle: Provide a rich chat app-like experience in the expanded notification using this style. Update user directions which are specific to Wear 1.0: Remove any text guiding users to act on a card by swiping horizontally (the Wear 1.x pattern). Enhancing notifications to use inline actions: This allows users to do things without needing tap to see the expanded notification details. Actions for messaging notifications can use several different input methods including Smart Reply presets, voice, and keyboard input. Take advantage of these features to provide added functionality and delight users. To learn more about adding wearable features to notifications. The complications API in Wear 2.0 makes it much easier for watch face developers and third-party data providers to surface important information users want, at a glance. Watch faces that support the API can be configured to use any of the data providers that have been installed on the watch while maintaining complete control over their appearance. Apps supporting the complication API allow the app's data to be accessible on any watch faces that support complications. 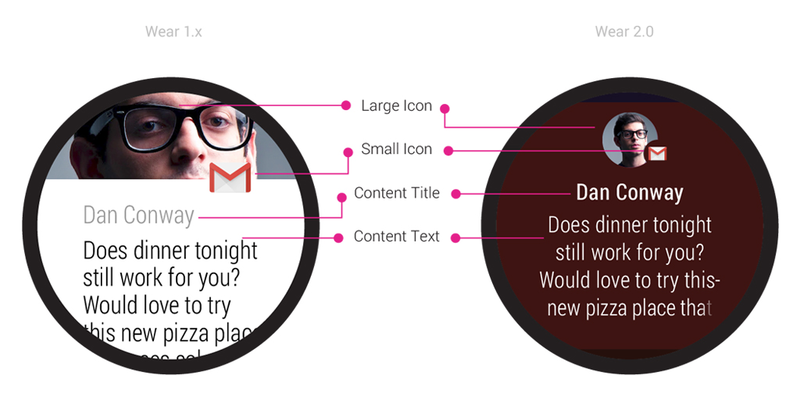 These complications can be displayed in a variety of forms (short text, icon, ranged value, long text, small image, and large image) depending on what the data provider has configured and how much space has been allocated on the watch face. Use the TextRenderer class found in the Wear 2.0 SDK: This allows the text within complications to be adjusted to their bounds by shrinking the text, dynamically supporting line breaks or ellipsizing strings when they exceed the bounds of a text-based complication. Use the ComplicationDrawable class to set the background color, shape, border, and font options for the complications: This gives complete control of how the complication is rendered to the watch face. Design the watch face to provide a way for users to configure or adjust complications on the watch face through a settings menu: To learn how to construct these settings see the watch face sample on GitHub. Use the data provider test suite app to feed dummy data to the watch face complications: This will enable you to verify that all of the complications render properly and have fonts formatted for their bounds. As a complication data provider, expose relevant data by using the ComplicationProviderService: Simply define and configure what types of ComplicationData the app can provide for complications. Make sure your app is able to handle itself if there is no companion app installed when using the android.hardware.type.watch hardware feature flag: Using this feature enables your app to become searchable and installable directly on Wear devices without needing to install a companion phone app, so ensure your app can handle itself to avoid a confusing or broken user experience. 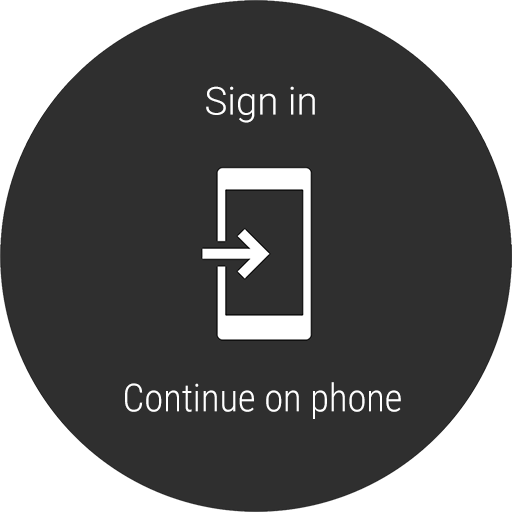 Ensure your wearable app doesn't rely on the phone app for sign-in/authentication or primary functionality: When requiring complicated input for authentication (for example, password entry) your wearable app can point to the companion phone, but should rely on web UI for account/password entry rather than an app. Where a companion app must be present on a phone to support your app in some other way, the app should use the CapabilityApi: This should be used to properly direct users to the Play Store listing on their companion device to install the missing app. Otherwise, the app should function on its own, using the Wear built-in Wi-Fi, GPS, or other connectivity functions. Include wording about any companion app requirements or briefly mention how your Wear app should function within the Play Store listing description: This will help set expectations and guide users to install the correct apps for the best possible experience. Incorporate the com.google.android.wearable.standalone flag in the manifest if your Wearable app can function without any phone companion interaction: This flag indicates that the wearable app can be installed and will fully function when not paired to an Android or iOS companion phone. Though a lot was covered here, there are additional resources you can use to ensure that your apps or games are optimized and use the latest patterns and functionality on Wear. Be sure to review the quality guidelines and check out the developer training documentation to learn more best practices for wearable app development and wearable app design in order to build quality apps for Wear. Android Wear 2.0 gives users more informative watch faces and provides developers with new ways to build useful apps. These new opportunities have been well received by users and developers alike. To help developers take advantage of these new features, we have released a suite of complication API tools, to make it easier for developers to add complication support to their watch faces, and a new Wear UI library, to help developers build watch friendly user interfaces. TextRenderer - Auto-sizes text to fit in bounds defined by watch face makers. Easy watch face settings sample - Adoptable sample code that makes it easier to build complication settings with a rich and usable experience. Complication test suite - A sample data provider to help check that your watch face can handle all the combinations of fields that can make up complication data. It's never been easier to integrate complications into your watch faces. 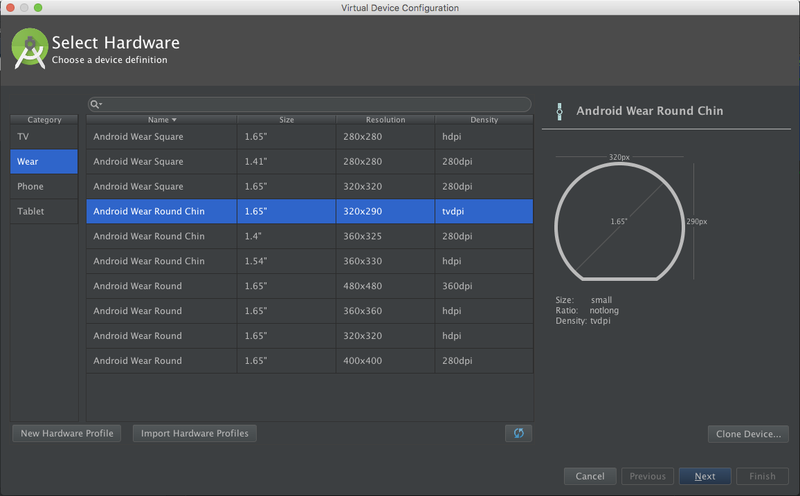 Migrate Wearable Support classes - Migrate and update Android Wear specific view components, such as WearableRecyclerView, from android.support.wearable.view in Wearable Support to android.support.wear.widget in the Android Support Library. This new package is available as open source. In terms of developer impact, we expect the migration process to be simple, with minor API name changes to bring consistency with the existing Android Support Library. Merge some Android Wear functionality to Android - Some Android Wear components have a lot of overlap with Android, e.g. CircledImageView and DelayedConfirmationView. 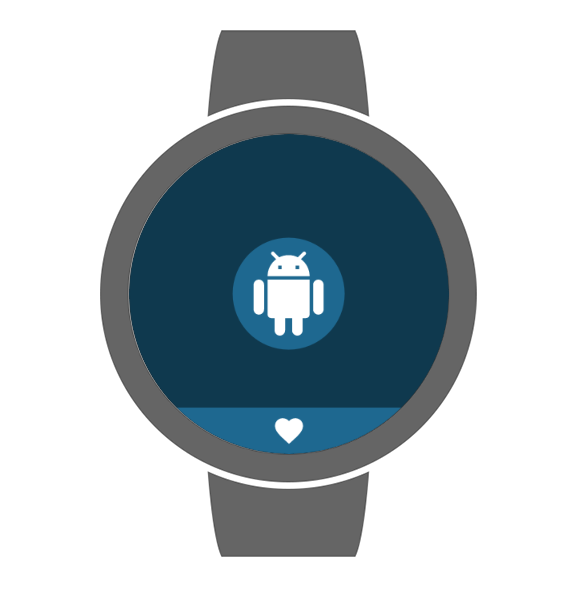 We will merge the Android Wear specific functionality with the Android counterparts under android.support.v4.widget. 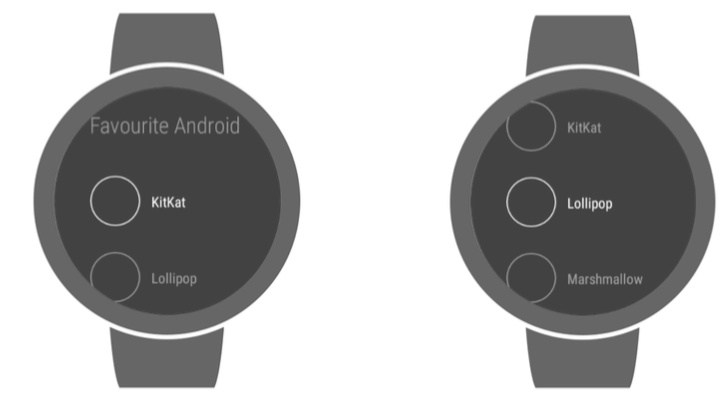 Deprecate outdated user interface patterns - Two user interface patterns are deprecated with Android Wear 2.0: the Card pattern and the Multi-directional layout. As a result, we have deprecated all supporting classes, such as GridViewPager and CardFragment. Please refer to the class reference docs for their replacements. In the first wave of these changes, we migrated the WearableRecyclerView, BoxInsetLayout and SwipeDismissFrameLayout classes to the new Android Wear UI Library. We expect the migration process to continue during 2017, and developers will have until mid-2018 to migrate to the new UI components. For additional information, see Using the Wear UI Library. Get started and give us feedback! To get started with these new tools, simply update the Android Support Library in Android Studio and update your gradle build files to import the new support libraries. In addition to the documentation links above, check out the Google I/O session - Android Wear UI development best practice - where lead engineers for these tools will be on-hand to explain the technical details. We will continue to update these tools over the next few months, based on your feedback. The sooner we hear from you, the more we can include, so don't be shy! Let us do some of the heavy lifting for your Android Wear apps and watch faces. Today, we are releasing the final SDK for Android Wear 2.0. In this release, we have added support for the new hardware features announced yesterday. If you have not done so already, it really is time to publish your apps so as to not miss the consumer hardware launch tomorrow. Throughout the developer preview program, you have given us a lot of constructive feedback as well as bug reports. Thank you again! 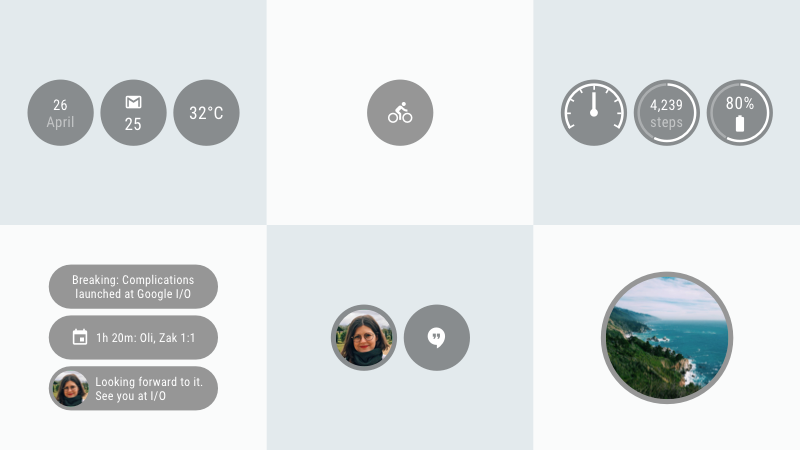 Material Design for Android Wear - A new system user interface and design guidelines, featuring a darker colour palette, vertical layout and visual components such as the WearableRecyclerView and WearableNavigationDrawer. We have also enhanced notifications on the watch with the new MessagingStyle rich notification style and inline actions. Watch Face Complications - Complications are areas of the watch face that display information other than time. Apps can supply data to supported watch faces by creating a ComplicationProviderService, and watch faces can render this data in a style that suits the watch face design. Standalone Android Wear apps and iOS support - Apps can now be downloaded directly to Wear devices via an on-watch Google Play Store. In addition, these apps can access the internet directly without relying on phone apps. 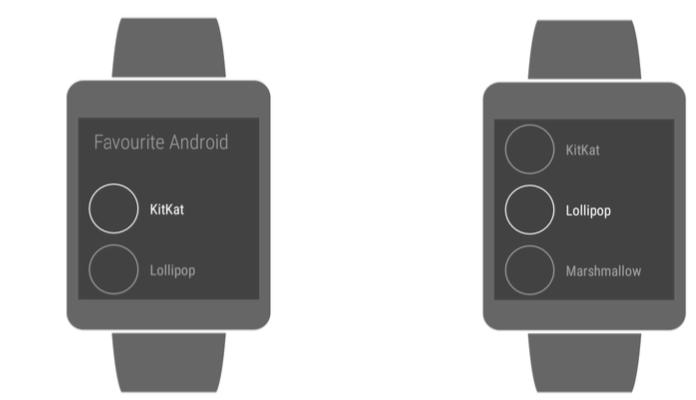 This means that apps can now run on Android Wear devices that are paired to iOS devices. The first two watches with Android Wear 2.0 give users more ways to interact with their smartwatches. 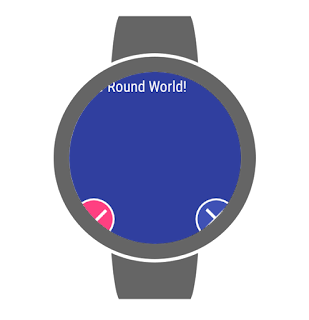 In the final SDK, we have added API support for physical button locations and rotary input. At present, developers will need the new LG Watch Style or LG Watch Sport to test these new functionalities; however, we are working to add these new hardware features to the emulator. Stay tuned for updates! The SDK also includes a few other final bug fixes, such as support for more than three items in the Wearable Action Drawer. Now that Android Wear 2.0 is live, we'll soon update the Android Wear App Quality review process with two important changes. 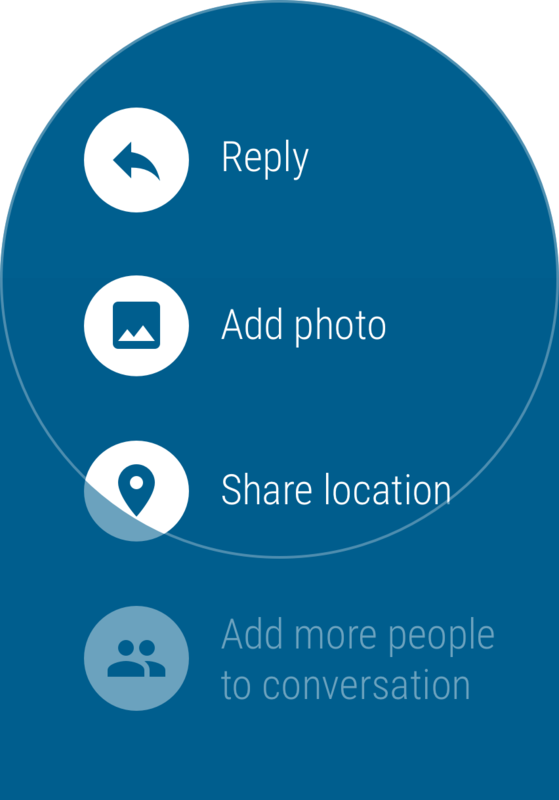 First, enhancing your phone app notifications for Android Wear will no longer be sufficient for passing the review. Second, it will soon be required that you upload a watch APK that's compatible with Android Wear 2.0. Only apps that pass these criteria will receive badging in Play Store on the phone and be eligible for top charts for Android Wear apps. These changes will ensure a more consistent experience for users and allow us to streamline the review process for you. The journey doesn't stop here! The Android Wear 2.0 developer preview lasted longer than we originally planned, but we think that the extra time has paid off in a big way. Thank you once again for your input and patience. You helped us achieve a higher quality bar than we could have achieved on our own. We have integrated the Android Wear 2.0 Developer Preview documentation into the main Wear developer documentation site and we continue to maintain links to the factory images for the preview devices. For developer related bugs, please continue to file developer bug reports or post comments in our Android Wear Developers community. From the Android Wear team: Thank you again for your feedback and support! Final Android Wear 2.0 Developer Preview: iOS support. Time to upload your apps to the Play Store! 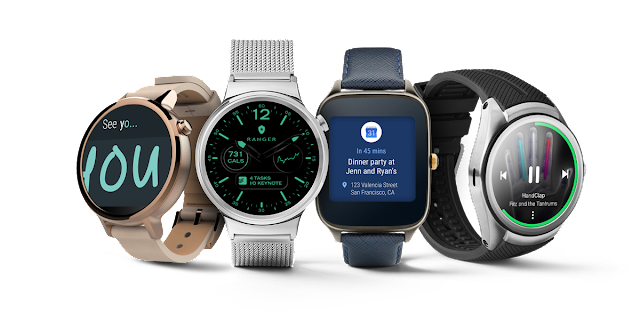 Today, we are releasing the fifth and final developer preview for Android Wear 2.0. In this release, we have added iOS support and included a number of bug fixes and enhancements. Apps compiled with this preview are now ready for final submission to the Google Play Store, so it's time to publish your apps. As Android Wear 2.0 approaches its final release in early February, we would like to thank you for your continued feedback during the developer preview program. Your input has helped us uncover bugs as well as drive critical product decisions. Thank you! Since 2015, you've been able to pair Android Wear watches with iPhones, and now you can distribute your apps to iPhone-paired watches as well. To do so, just set the standalone=true flag in your watch app manifest. This lets the Play Store know that your watch app doesn't require an Android phone app, and therefore can appear in the Play Store on watches paired to iPhones. To pair your watch to an iPhone and test, just follow these steps. The available network bandwidth for standalone apps can be lower than expected, as the platform balances battery savings vs network bandwidth. Make sure to check out these guidelines for accessing the network, including accessing Wi-Fi and cellular networks on watches paired with iPhones. Also with this developer preview release, Android Wear apps running on watches paired with iOS devices will be able to perform phone hand-off flows such as OAuth and RemoteIntent for launching a web page on a paired iOS device. 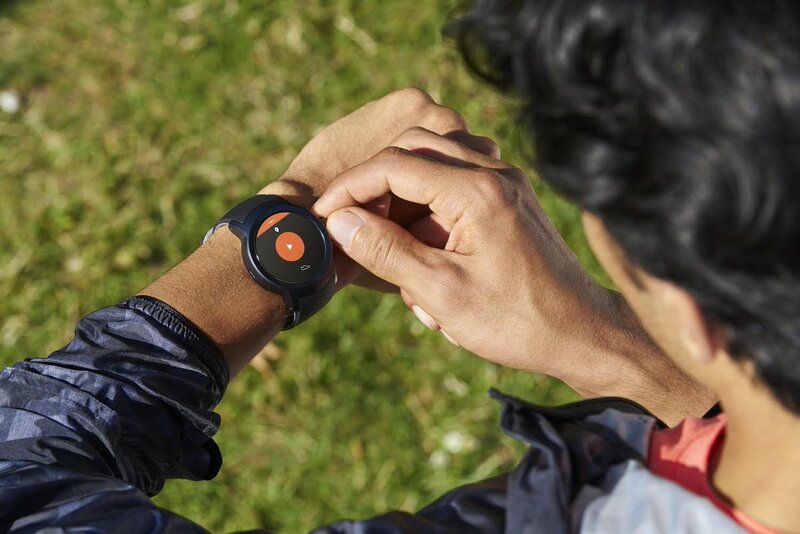 The final developer preview includes an update to the Wearable Support Library. Apps compiled with API level 25 and this support library are considered ready for deployment in the Google Play Store. Please note that there are no updates to the preview watch image or emulator in this developer preview release. Navigation Drawer: Flip a flag to toggle to the single-page, icon-only navigation drawer, which provides faster, more streamlined navigation to different views in your app. NFC HCE support: NFC Host Card Emulation FEATURE_NFC_HOST_CARD_EMULATION is now supported. ProGuard and Complication API: New ProGuard configuration means complication data container classes will no longer be obfuscated. This fixes a ClassNotFoundException when watch faces are trying to access data supplied by a complication data provider. Thank you for the fantastic level of feedback we have gotten from you as developers. Check out g.co/wearpreview for the latest builds and documentation, and be sure to publish your apps before the Android Wear 2.0 consumer launch in early February. As we work towards the consumer launch and beyond, please continue filing bugs or posting comments in our Android Wear Developers community. We can't wait to see your Android Wear 2.0 apps! The upcoming Android Wear 2.0 experience will introduce standalone apps, expanding your potential reach to both Android and iOS audiences with Wear devices. Users will be able to search, install, and use apps without ever leaving their device. See how other developers are enhancing their user experience with standalone apps for messaging, travel & local, and health & fitness. Having a watch app further simplifies video messaging with Glide. Using the Wear Complications API, Glide is now able to live broadcast directly from the watch face. By tapping contact shortcuts from the watch face, you can now launch directly into a conversation. This experience brings speed and intimacy to the world of messaging, making wrist-based communication more accessible and effortless. Travelers around the world use Foursquare's Android Wear app to discover hidden gems and be in the know about the best places to eat, drink and explore. With their upcoming 2.0 app, the team has a clean new canvas for rich notifications giving users an immersive experience with Foursquare content. "The standalone nature of the Android Wear 2.0 app will offer a big boost in search performance and app responsiveness so you spend less time staring at the screen and more time exploring the world around you," said Kyle Fowler, Software Engineer at Foursquare. Lifesum helps users make better food choices, improve their exercise, and reach health goals. The upcoming 2.0 experience complements the existing Lifesum mobile app and as a standalone app, it will allow users to more easily track water and meals throughout the day. Check out g.co/wearpreview for the latest builds and documentation about the recently released Android Wear Developer Preview 4. At Google I/O 2016, we launched the Android Wear 2.0 Developer Preview, which gives developers early access to the next major release of Android Wear. Since I/O, feedback from the developer community has helped us identify bugs and shape our product direction. Thank you! Today, we are releasing the second developer preview with new functionalities and bug fixes. Prior to the consumer release, we plan to release additional updates, so please send us your feedback early and often. Please keep in mind that this preview is a work in progress, and is not yet intended for daily use. Platform API 24 - We have incremented the Android Platform API version number to 24 to match Nougat. You can now update your Android Wear 2.0 Preview project’s compileSdkVersion to API 24, and we recommend that you also update targetSdkVersion to API 24. 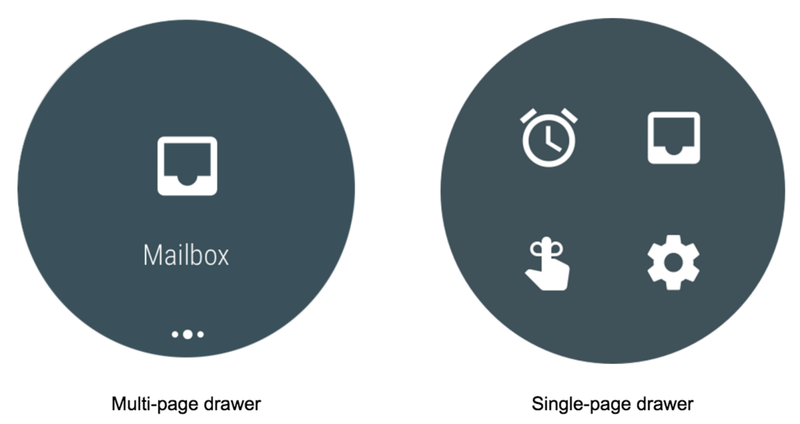 Wearable Drawers Enhancements - We launched the wearable drawers as part of the Android Wear 2.0 Preview 1, along with UX guidelines on how to best integrate the navigation drawer and action drawer in your Android Wear app. In Preview 2, we have added additional support for wearable drawer peeking, to make it easier for users to access these drawers as they scroll. Other UI improvements include automatic peek view and navigation drawer closure and showing the first action in WearableActionDrawer’s peek view. For developers that want to make custom wearable drawers, we’ve added peek_view and drawer_content attributes to WearableDrawerView. And finally, navigation drawer contents can now be updated by calling notifyDataSetChanged. 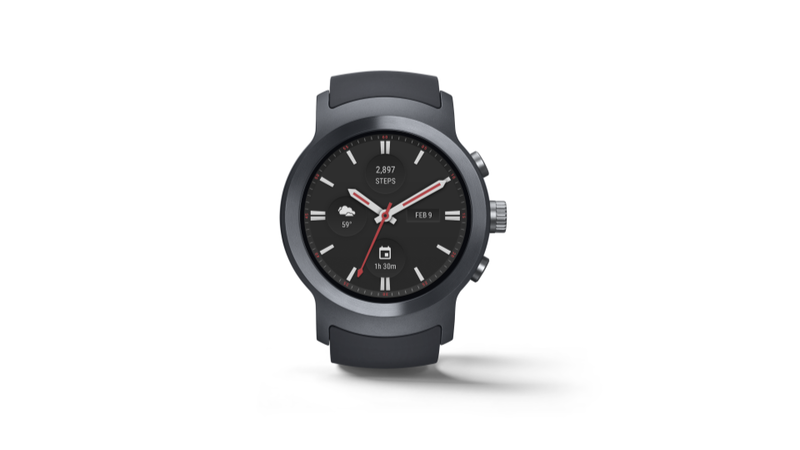 The Android Wear 2.0 Developer Preview includes an updated SDK with tools and system images for testing on the official Android emulator, the LG Watch Urbane 2nd Edition LTE, and the Huawei Watch. We will update this developer preview over the next few months based on your feedback. The sooner we hear from you, the more we can include in the final release, so don't be shy! Today at Google I/O, we announced the most significant Android Wear update since its launch two years ago: Android Wear 2.0. Based on what we’ve learned from users and developers, we're evolving the platform to improve key experiences on the watch, including watch faces, messaging, and fitness. Android Wear 2.0 will be available to users this fall. We’re making a Developer Preview available today and plan to release additional updates throughout the summer, so please send us your feedback early and often. Also, please keep in mind that this preview is a work in progress, and is not yet intended for daily use. Standalone apps: Your Android Wear app can now access the internet directly over Bluetooth, Wi-Fi, or cellular, without relying on the Data Layer APIs. This means your app can continue to offer full functionality even if the paired phone is far away or turned off. Removing the requirement to use the Data Layer APIs also enables your app to offer the same functionality regardless of whether the watch is paired with an Android or iPhone. In addition, your app can receive push messages via Google Cloud Messaging and access AccountManager directly on the watch. New system UI: We’ve made a number of UI changes that will help users interact with your app more easily. A new notification design and app launcher make it easier to take action on notifications and launch your app, and a new watch face picker makes switching watch faces fast and fun. The system UI also adopts a dark color palette and makes better use of round displays. We recommend you test your existing Android Wear app and notifications with the new UI. Material design for wearables: The new Material Design for Wearables guide will help you make your app’s interface more consistent, intuitive, and beautiful. The new navigation drawer and action drawer components in the Wearable support library make it easy to align your app with the system UI’s new vertical layout. We’ve also provided guidance on how to adopt the dark color palette. Complications API: Complications are bite-sized pieces of information displayed to users directly on the watch face. Android Wear now has a system-wide framework to enable any app to show data on any watch face that implements the API. As an app developer, you can choose to publish your data to a wide variety of watch faces and make it easier for users to launch your app from the watch face. As a watch face developer, you can rely on data from a rich ecosystem of Wear apps without having to worry about sourcing it yourself. Input methods: Keyboard and handwriting input methods open up new ways to accept text from users on the watch. You can now use these new input methods in your app via RemoteInput and EditText, and notifications that already use RemoteInput for voice replies will automatically support the new input methods. We’ve ported over the full Android input method framework to the watch, so you can even create your own custom input methods if you wish. New MessagingStyle notification: Android Wear 2.0 includes a new notification template with a layout optimized for quick and responsive messaging. This template is also available on phones and tablets using Android N, so creating a great cross-device messaging experience is a breeze. Google Fit platform: Improvements to the Google Fit platform make it easier for your app to use fitness data and detect activity. You can register a PendingIntent to be notified of changes in the fitness data store, so you don’t have to keep querying for changes to weight, nutrition, and other data types. It’s also easier for your app to get a consistent daily step count on Android Wear -- with HistoryApi.readDailyTotal(), a step recording subscription is no longer required. Finally, apps will soon be able to detect (with consent) when the user starts walking, running, or biking. Support for Android N: Your Android Wear app can now take advantage of the latest Android N features such as Data Saver and Java 8 Lambda support. Also, let’s not forget the new emojis! The Android Wear 2.0 Developer Preview includes an updated SDK with tools, and system images for testing on the official Android emulator, the LG Watch Urbane 2nd Edition LTE, and the Huawei Watch. Android Wear is about choice. 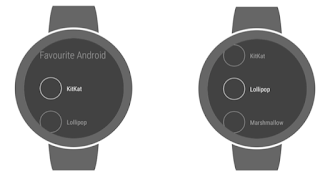 From the beginning, users could choose the style they wanted, including watches with circular screens. With Android Wear API 23, we have enabled even better developer support so that you can code delightful experiences backed by beautiful code. The key component of this is the new round resource identifier which helps you separate resource files such as layouts, dimens between round and square devices. In this blog post, I will lay out the options that developers have and why you should consider dimens.xml! In addition, I will outline how best to deal with devices which have a chin. If all your content can fit into a single square screen, use the BoxInsetLayout. 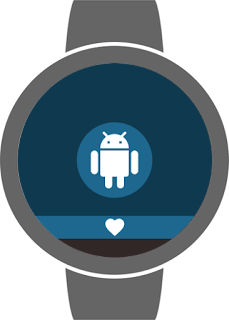 This class has been included in the Wearable Support Library from the start and helps you put all the content into the middle square area of the circular screen and is ignored by square screens. For details on how to use the BoxInsetLayout, refer to the Use a Shape-Aware Layout section in our developer guide. Maintaining multiple layout files is potentially painful. Each time you add a screen element, you need to go to all the layout files and add this. With mobile devices, you will usually only do this to specify different layouts for phones and tablets and rarely for different phone resolutions. For watches, unless your screen layout is significantly different between round and square (which is rare based on the applications I have seen thus far), you should consider using different dimens.xml instead. Before API 23, to do the same would have involved a significant amount of boilerplate code manually specifying the different dimensions for all elements on the screen. With the -round identifier, this is now easy to do in API 23 and is my favourite way to build round / square layouts. Although the padding setting in the layout will be ignored, the code is tidier if we remove this redundant code. If you require more control than what is possible declaratively using xml, you can also programmatically adjust your layout. To obtain the size of the chin you should attach a View.OnApplyWindowInsetsListener to the outermost view of your layout. Also don’t forget to call v.onApplyWindowInsets(insets). Otherwise, the new listener will consume the inset and inner elements which react to insets may not react. Square peg in a round hole no more! Android Wear has always been about empowering users to wear what they want. 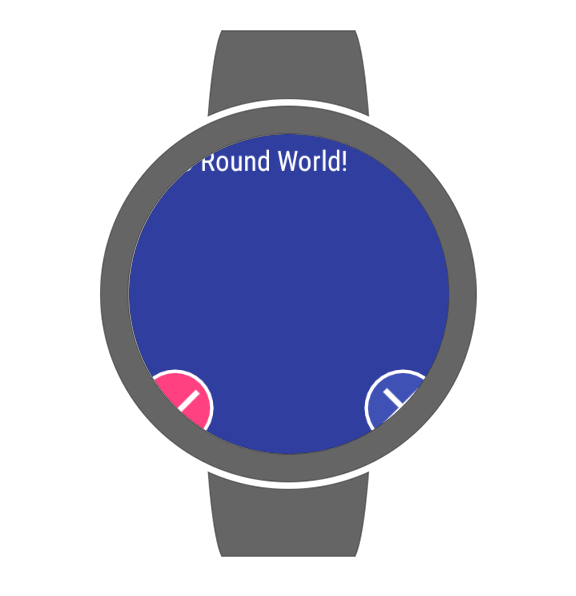 A major part in enabling this is the round screen. With API 23 and the -round resource identifier, it is easier than ever to build for both round and square watches - delightful experiences backed by beautiful code! Why would I want to fitsSystemWindows? by Ian Lake - Best practice for using this powerful tool including its limitations. ScreenInfo Utility by Wayne Piekarski - Get useful information for your display including DPI, chin size, etc.